Welcome to The Pyrotechnic Artists of Texas! The purpose of the Pyrotechnic Artists of Texas, otherwise known as PAT, shall be to promote and encourage safe, legal and artful pyrotechnic design, construction, operation and enjoyment in Texas through training, demonstration and exchange of information. 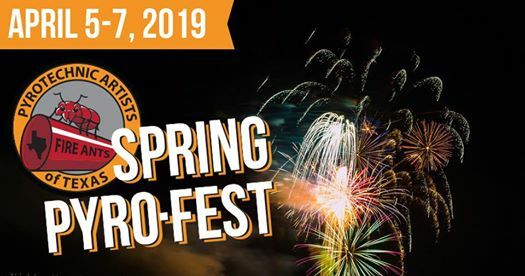 Spring Pyro-Fest 2019 is focused on sharing pyrotechnics display and manufacturing experiences and knowledge. There will be an opportunity for Texas TDI – Fireworks Pyrotechnics Operator(FPO) – License Sign-Offs available to those who participate in building the guided 1.4G (C) and 1.3G (B) Displays. There will also be guided Manufacturing of Pyrotechnics Effects on-site. Gates Open 10:00am. Manufacturing Open 10:00am – 11:00pm. Open Shooting 12:00pm – 11:00pm, no salutes after 10:00pm. Manufacturing instruction during the day. We encourage members, especially those manufacturing, to arrive on Friday. This is the best opportunity to meet, make connection, catch up and prepare for Saturday. Mandatory Safety Class at 10:00am. Manufacturing Area Open at 10:00am. Instruction in 1.4G (C) product types and techniques and a 1.3G (B) Display will be built during the day. Instruction on Manufacturing during the day. Barbecue Dinner catered on site. Display will be ignited at 9:00pm. There will be Open Shooting from 12:00pm – 11:00pm, with no salutes to be ignited after 10:00pm. Clean Up in morning. This is Required for members wanting Texas Licensing Sign-Off. – 2018 PAT Membership $120 + Event Fee $30 – Includes Saturday Barbecue. Only Members of PAT may handle Fireworks. – Viewer Pass $30 – Viewer you can watch Training, Demos, and attend Saturday Barbecue. Viewers can not handle, or Ignite Fireworks. – Children Under 16 FREE – Children under the age of 16 are free. Guardian should be with in arms reach at all times.